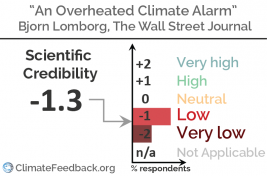 "Lomborg is using scientific ‘language’ to suggest that climate change will have insignificant health impacts; this goes against a vast body of evidence. The notion that benefits from warmer winters could be more important than risks from hotter summer in terms of human health is plain wrong." 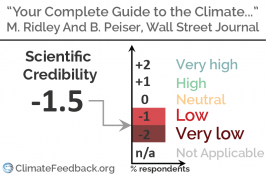 "It sadly implies that even the PETM, a massive warm climatic excursion, might not be harsh enough to represent an analogue for future climate change, as the Washington Post rightfully points out." 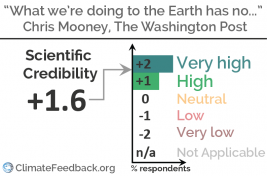 "This article misses some major intellectual points about ocean acidification, thanks to what seems to be a willful misunderstanding and misquoting of an interview with Dr. Browman on an Ocean Acidification special issue journal." Justin Gillis reports on new results showing that the current rate of sea level rise is unprecedented in a record dating back 2,000 years. The article explains that this rise is attributable to human induced climate change and that higher sea levels are already impacting coastal communities. The seven scientists who reviewed the article confirmed that it is accurate and insightful. "This article is indeed a snow job, as the title implies. The author has twisted the facts and distorted the science wildly. The author is well known for his wildly inaccurate climate "forecasts"." 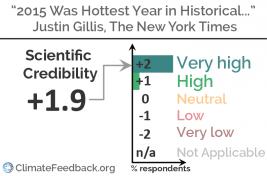 "This article makes startlingly inaccurate claims about the earth’s surface and satellite temperature records, as well as attempts to ascertain the earth’s temperatures over the past two millennia through proxy measurements. 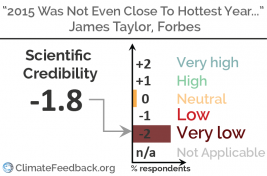 The author would do well to talk to scientists involved in surface and satellite records and to consult the peer-reviewered scientific literature rather than blogs when writing in the future." "The article presents an accurate account of recently published research which suggests that human-induced global warming will delay the onset of the next ice age by 50,000 years. The research supports the findings of several studies published over the past 15 years, and is consistent with the scientific consensus that human activity is changing the climate with very long-term consequences." "This article peddles the usual false statements masquerading as opinion that we have been seeing for years, and would not be published by a reputable publisher. 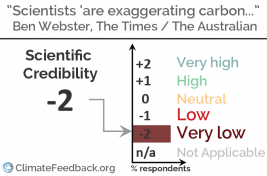 Most of the scientific statements in the article are false or misleading." "This article wins the Olympic gold for cherry-picking data, misleading claims, and a long list of scientifically unsupported assertions."